Building a home is a meaningful experience that will bring you years of wonderful memories. Crane Construction provides you the opportunity to create a home that represents you and your style. Whether you envision a home that is 1,000-square-feet or 12,000-square-feet, Crane Construction will be honored to custom-build a quality home for you. We relish in achieving positive results, in which customers love their home and enjoyed the building experience with Crane Construction. 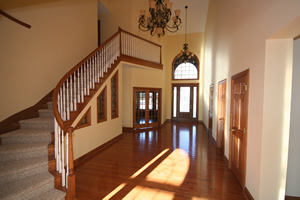 Numerous customers also utilize our construction services to remodel their home. We would be happy to design and build a new addition or make changes to any area of your home. Our design/build turn-key services enable you to save time and avoid stress, by both designing your home and building it for you. Our team of professional architects, contractors, and suppliers has worked with us for many years and would be pleased to serve you. Customers experience an ease and comfort as they build their home. We create a process that is simplified and guided, helping you understand the options and details. We accommodate you based on your needs. Come to us with your own designs/prints, a parcel of property, or with just an idea, and we will create your dream. Crane Construction is a preferred builder for Hidden Lake, one of Livingston County's premier lakeside developments. View Crane Construction's Communities Here.